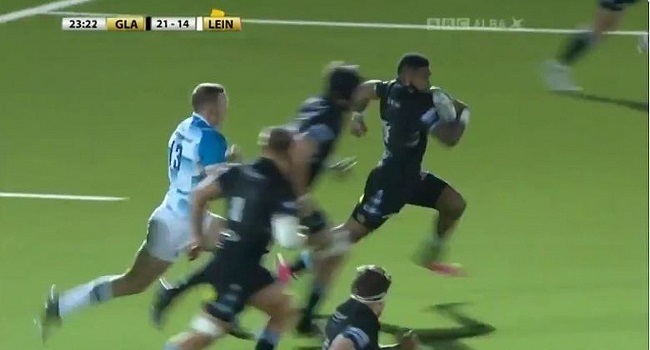 Nikola Matawalu set up a try for his Glasgow side against Leinster this morning to help them beat their opponents 31-21 in the PRO 14 rugby competition. Matawalu, who played on the wing, collected the ball on his own five meter line, broke numerous tackles and handed it over to hos outside centre to dive over for a try which could easily be a contender for the try of the season. The win sees Glasgow stretch their unbeaten run to eight matches this season. They lead the standings with 38 points, 12 ahead of second placed Munster. Meanwhile, in the French T14 competition, Montpellier plays Clermont at 4.50am on Monday and you can watch it live on FBC TV.